The Department of Transportation (DOT) fined JetBlue $90,000 for not telling passengers that they could deplane (if they wanted to) as they sat on the tarmac for about three hours. In addition, passengers sitting on a flight that is delayed are legally entitled to notifications of the status of their flight every 30 minutes, as well as announcements every 30 minutes that they have the right to deplane from an aircraft if at all possible. Basically, an airline is not allowed to trap passengers in a plane for a stretch of hours without giving them some options. 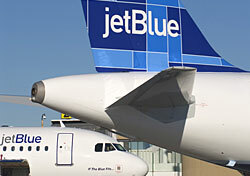 Do you think JetBlue got what it deserved?